Used to have one in my car and the cheapest I can find it £4-5+ on eBay. Picked one up and it's superb, it's actually more tacky/better than my first one and was a quid. Nice suction mount too, not cheap or flimsy, holds a Z3 easily. We have this and it is really good. Definately worth more than a pound. Loads in Poundworld in St Albans. Was hoping the extended mount would accept the Garmin ball and socket on my Satnav but its a lot smaller, anyway for what it is intended for its pretty good. It's all about the angle. It's got a 10-degree area of working... but once you have it nailed, its solid. Looks like a Poundworld font/display to me, rather than Poundland! I bought four of these a while ago. They're great for a couple of weeks and then, with all of them, the suction cup came loose and eventually broke away from the plastic arm. They're OK for a quid but their not exactly quality products. 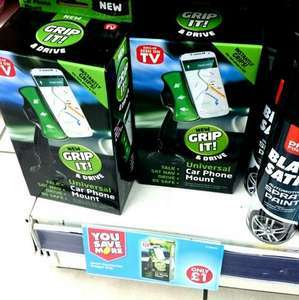 They sell them on and off in PoundWorld. Had mine about a year and went to get some for friends and had none. Will have to pay another visit now. If the mount looses its stickiness, just get a damp cloth and wipe over it and will be as good as new! i bought one a few weeks ago and think its well worth the pound. doesnt leave any residue and sticks well to my phone cover. phone fell off once so now in the habit of pressing phone firmly on the pad before driving off. need 2 hands to peel phone off cradle pad. These are great! Been using mine for months! Going to get one for my dad for his Christmas! isn't that a pound world P.O.S ? Definitely Poundworld not Poundland. They've been available for months. They're pretty good especially for a pound. I paid £10 for one off Amazon and it was very bulky and unsteady. This was excellent for the £1 I paid for it and works well with my Xperia Z3 with a case on it. Hot. Been using mine all year. Love it! Does anyone that owns one of these holders actually drive round corners or use their brakes? Not trolling, I'm just so dubious about the grip when you do some spirited driving or evasive manouvers. mine was great,dropped it and broke! I struggled to get the phone off it! Great mount, even bought a second as a spare. Lucky I did, as my first one melted in the recent hot weather whilst using Waze on my Z3 Compact (so the phone was very hot also). Looks like the outer coating split as I was peeling the phone off, leaking sticky stuff on my dash. Other than that these are fantastic and grip very well - could even hold my iPad 2. Well worth a go for £1 (which I managed to get from Poundworld a few months back, so check there also). I bought two of these separately. They were great for a few weeks, including long journeys to use an iPhone as a sat nav, but eventually the plastic no longer holds the suction cup in place and it breaks, just as another person found. Good for one or two long trips for the price, but now looking for something more reliable for a trip to France. I've had a couple of these now, I really like them although they do seem to deteriorate over time. The first one eventually 'popped' and became extremely sticky with residue remaining on the phone. On the second one, the sticky pad has come away from the plastic mount... suggesting the tacky side creates a stronger bond than the glue its attached with?! we've resorted to sticking just the pad onto the dash (Ford Mondeo) and then sticking the phone to the tacky side. If yours starts to loose its tackyness, a rinse/rub with some warm soapy water makes it like new. I've been using our with Nexus 4 and Nexus 5, both of which have a relatively flat, smooth back. neither have had any difficulty adhering. The main reason I chose this in the first place was that the mount almost becomes invisible if position correctly. Had one of these - gave up pretty quickly. Nexus 4 doesn't stay stuck to it - and most suction cups on these things deteriorate over time. Now using a great mount that slots into the CD slot, and has a firm spring grip to hold the phone. Works MUCH better than any suction cup (or those ones with dodgy clips for the air vents) - Got it from an amazon seller for about £8 - and well worth it! It seems good grasp first, but my phone dropped and screen cracked after half an hour of driving. Just bought in Leicester Poundworld. Definitely not Poundland. Love the flash on the pack that says 'Similar seen on TV'. Wrong store and old story - posted months ago. That said the product hasn't let me down yet! Does anyone that owns one of these holders actually drive round corners … Does anyone that owns one of these holders actually drive round corners or use their brakes? Not trolling, I'm just so dubious about the grip when you do some spirited driving or evasive manouvers. Live in Scotland loads of A & B roads with potholes,love it. Had one of these - gave up pretty quickly. Nexus 4 doesn't stay stuck to … Had one of these - gave up pretty quickly. Nexus 4 doesn't stay stuck to it - and most suction cups on these things deteriorate over time.Now using a great mount that slots into the CD slot, and has a firm spring grip to hold the phone. Works MUCH better than any suction cup (or those ones with dodgy clips for the air vents) - Got it from an amazon seller for about £8 - and well worth it!